Mumbai: The year since September 2008 has been a tough one for Indian information technology (IT) services companies whose customers are largely based in the US and Europe, but analysts say that rational competition—as opposed to predatory pricing and undercutting—has helped protect the profitability of most firms. Thus, while Infosys Technologies Ltd’s so-called onsite billing rates fell from an average of around $70 (Rs*********) an hour in September 2008 to $66.5 in June, Wipro Ltd’s rates fell from around $68 an hour to $67. Infosys has since improved its billing rates marginally according to its results for the September quarter. Wipro is yet to announce its results for the quarter. The slowdown in the US and Europe has resulted in a sharp cut in IT budgets of companies based there. Many such companies that outsource work have cut the volume of business, asked Indian companies servicing them to do the same work for less, or both. To be sure, Indian companies have responded with discounts but analysts say they haven’t, so far, resorted to undercutting each other’s prices. “Compared to the last major crisis that Indian IT industry went through, pricing negotiations are a lot more evolved and disciplined this time around, as processes and systems are much clearer now," said Abhijeet Ranade, associate director, technology advisory services at the Indian arm of global audit and consultancy firm PricewaterhouseCoopers. 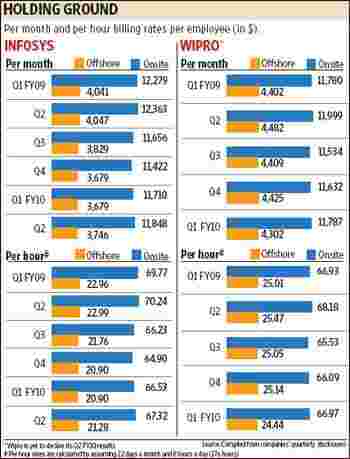 Thus, Infosys’ so-called offshore billing rates have fallen from an average of around $23/hour in September 2008 to $21 in September 2009 and Wipro’s from $25/hour to $24 in June. IT services companies typically split their work into onsite or work done for customers where they are based, and offshore, or work done for them in the India development centres of the IT companies. India’s largest IT services firm Tata Consultancy Services Ltd (TCS) does not report number of hours billed, making it difficult to calculate its billing rates. IT industry executives say that the way Indian firms have responded to requests for lower rates in a hyper-competitive environment indicates their growing maturity. Manish Dugar, chief financial officer of Wipro Technologies Ltd, Wipro’s software services division, said companies are looking at the “sustainability of pricing over a long term". This, Dugar added “ensures that the pricing behaviour, especially among tier 1 players, is sustainable in the medium term. Accordingly, the scope for consistent under-cutting to gain market share is inherently difficult". The top tier of Indian IT services companies includes Infosys, Wipro, TCS and HCL Technologies Ltd. Still, there are times when “competitive pressures" lead to “opportunistic and tactical pricing", Dugar said. Still, such instances have been few and far between, say analysts. One reason for the decline in billing rates being far lower than the decline in 2000-01 in the wake of the dotcom crash is the high rates that were being charged by firms before that crash, say executives. “In 2000, the price cuts offered were much more drastic as existing rates offered room to do that. Plus back then, need to acquire clients was more intense, which is not the case today as most large firms have a good existing client base," said Rostov Ravanan, chief financial officer at Bangalore-based mid-size IT services firm MindTree Ltd.
Another reason for the lack of this “irrational behaviour", according to TCS’ chief financial officer S. Mahalingam is the realization among firms that “once you cut prices, you’ll never get that back". Companies also fear that any move by them to undercut prices of their rivals could force customers to ask for even lower prices, added Ravanan. Interestingly, Indian companies are not displaying the same restraint while bidding for domestic contracts, according to Ranade. In the past year, business from Indian companies that continue to grow despite the slowdown has become a focus area for all IT services firms, even those that had not aggressively sought such business in the past. Ranade said that “extremely value-conscious clients" are also partly “to blame for this". Infosys, Patni Computer Systems Ltd and HCL Technologies did not respond to queries from Mint.